Managed to get the Castigator built up to the point that it's ready for primer! I have to say I thoroughly enjoyed building this kit, though there are a couple things I'd do differently next time around knowing what I know from the initial build. I kept all of the armour plates separate for the time being, which will allow me greater access to the under-chassis of the model and facilitate painting. That means the model is a little skeletal looking at the moment, but once the plates are on it definitely bulks up! The model is currently separate at the waist as well (currently just held in place by a big ol' honkin' pin), though the arms are permanently attached. Quite pleased with the overall pose, opening up the arms from the body and rotating the torso and head gives it an interesting sense of forward motion - not running as I'd likely do the Lancer (and I am much more inclined to pick one up now), but a solid advance while mowing down infantry with the gatling bolter. I was slightly disappointed that the sword arm is solid at the wrist, so you're pretty much stuck with elbow and shoulder for posing on that side. 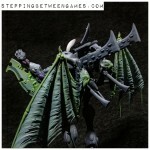 Nevertheless, I like it as a counterpoint to the reaper chainswords on the Paladins. Now THAT'S an ammo hopper! In retrospect I would have actually been better off building the left leg bent at the knee and the right leg straight, as I found the more extended rearward placement of the leg interfered somewhat with the available torso rotation options due to the ammo belt hanging so far down. As I'd cocked the gun outwards about 25 degrees I ended up needing to hot-water bend the ammo belt into place to fit the two receiver sockets anyway, so incorporating the leg position wasn't a dealbreaker. With the leg up and out of the way however, I think one could get some really interesting posing out of the gun arm. 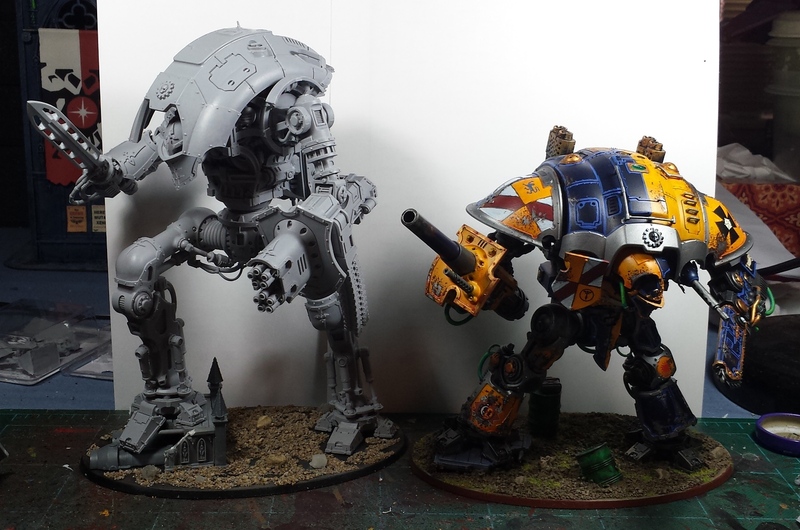 Here's a scale shot of the Baron compared to the paladin model - definitely think the two paladins acting as Squires is fitting scale-wise when they're on the table, though I do still contend that either the FW knights are slightly too big, or the GW knights are slightly too small. 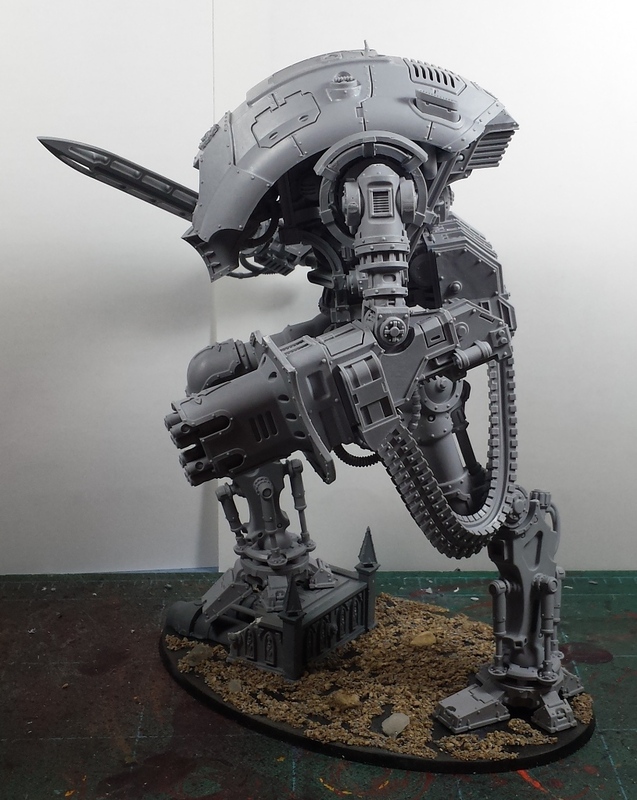 The Castigator is nearly the height of the 25mm Dreamforge leviathan! yeah, that's kind of awesome. Great job with the pose! Wow. A fantastic looking model mate. Much better looking than some of the other images I've seen suggest. You definitely captured a sense of movement through it. 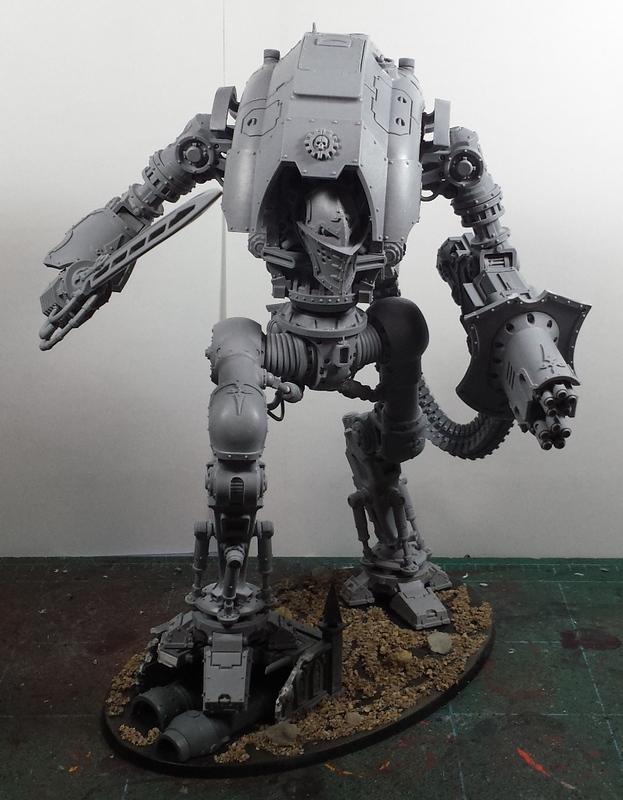 Do you know how does it scale against a Warhound? 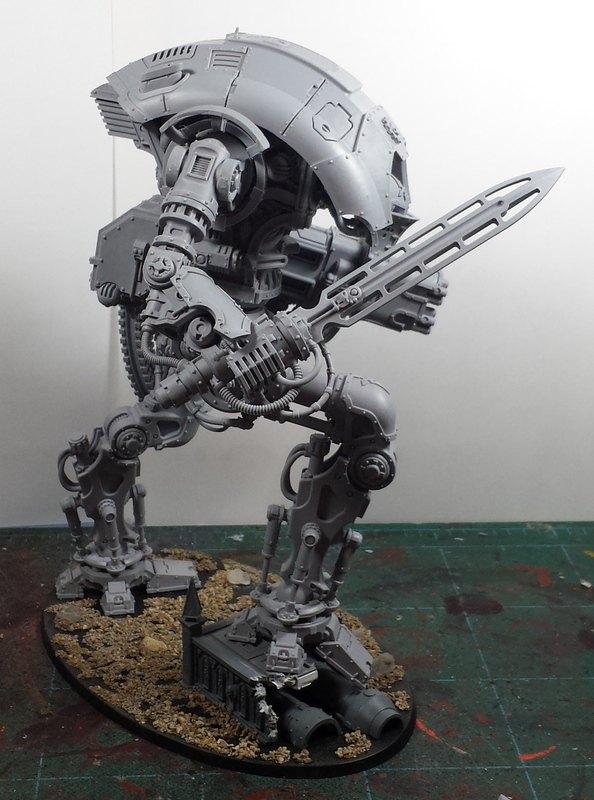 Great pose mate, really sold me on the FW knights being worth the money compared to the GW ones. Epic! I see what you mean about it looking so much better when put together, and that side-by-side shot with the GW knight makes it look a lot less gangly and in keeping with the aesthetic. 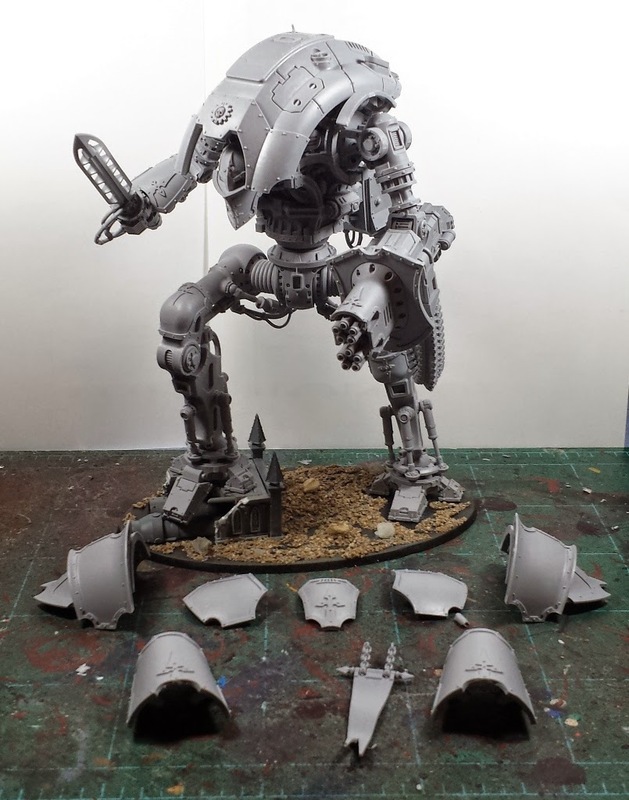 Nice to know its similar in size to the Dreamforge, I've had one of those under the bed since the kickstarter and it looks like it could be seeing some action as a knight based on that comparison. Totally stunning.. When are they released? On a related topic, it's fw resin, right? So add one hair dryer and that ammo belt can be hanging wherever you like? @Zab: Thanks man! Hoping to get some paint on it over the weekend! @Frothing Muppet: I appreciate it! The pics on the FW site and on the instructions are very static, was rather pleased with how much motion the kit actually allows! 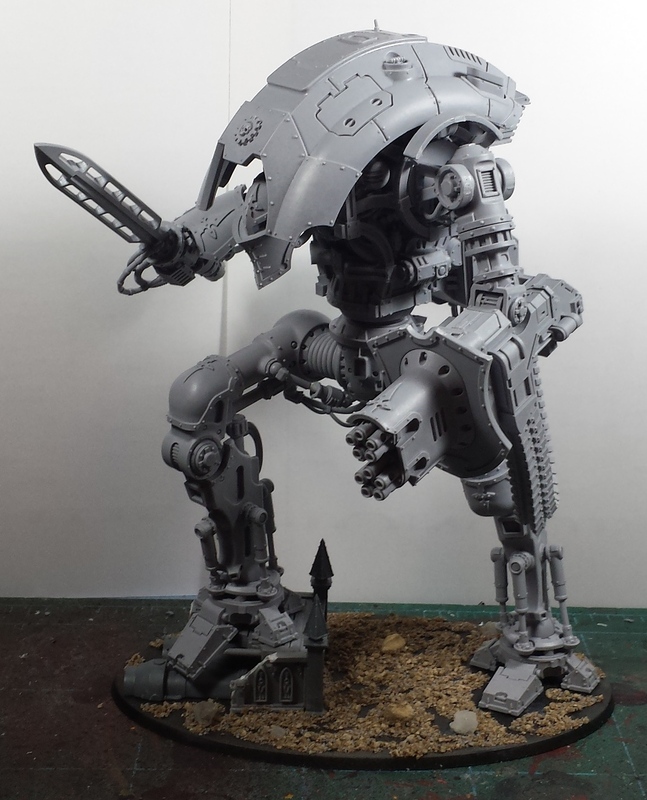 I don't have a warhound to compare it to, but based on other pics I've seen it's a good inch or two shorter than the lucius pattern, and far less wide. @Sheep: Aye, they're not exactly cheap, but for the extra price it's a WAY cooler kit. They cut me a little bit of a deal on it at GenCon too which was a surprise. @Andrew: Totally! I'd put my dreamforge leviathan on hold but might need to bring it back out of storage! @#2501: Nice - I look forward to seeing your lancer, always love the metal patina effect you do! @Karitas: Should be released any day now from what they said at the FW booth! Yes on the hot water/air bending, the ammo feed needed a fair bit of manipulation to get it to attach as shown here due to the way the left leg is sort of angled backwards. It was pretty simple to do though! Wow! Awesome work. Posing is fantastic. It really comes to life! @Adam Wier: Thanks man! Was well pleased with the available posing options on this kit, looking forward to picking up a lancer and really push the running pose! @The Eye of Error: Thanks! Going to try the 'open petals' on the Thanatar similar to what you've done - that's next up in the build queue! You, sir, are my hero. This post made my day. 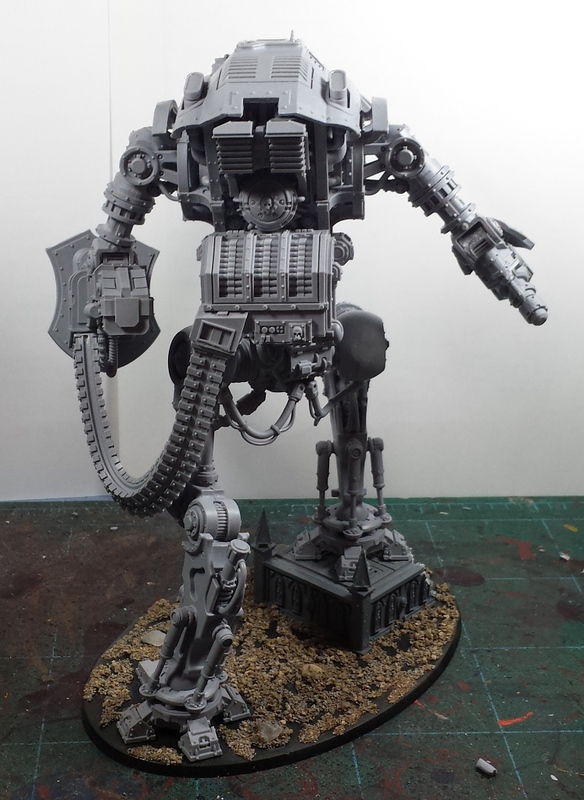 Looking forward to seeing this beast painted up. @Eater of Small Things: Cheers, man! Painting in progress pics incoming!